The Rega RP8 turntable plinth uses a totally new material has been developed exclusively for Rega over a three year period. Rega has always employed light but stiff rigid plinths using lightweight particle board sandwiched between stressed skin structures. The new material consists of featherweight nitrogen expanded, closed cell, polyolefin foam core sandwiched between thin phenolic skins. Again a double brace "stressed beam" assembly, first used on the RP3, is deployed only this time two different materials are used; a magnesium top layer and a phenolic bottom layer. Because each layer has a different natural resonances, used together they decrease the natural frequency of each other by self damping and make the plinth - which is already 7 times lighter than the weight of the original Planar 3 plinth - further immune to unwanted airborne vibrations. By adding even more stiffness in the crucial area between the arm and the main bearing, relative movement is reduced preserving the delicate stylus movements. This is all technically brilliant but sensibly the RP8 also addresses the practical issue of - dust. A common, but often relegated problem for many turntables is the inability to incorporate an effective dust cover into the design. Records pick up most dust from the turntable mat itself. Dusty records clog up the stylus and this is a nuisance. With the RP8, Rega has ingeniously constructed an outer frame for the skeletal inner plinth that only docks via three location devices on the feet thereby minimizing contact between the inner and outer plinth. This makes set-up extremely easy and allows the use of a dust cover while the RP8 can alternatively be used without the outer frame if so desired. The turntable platter requires sufficient mass to achieve constant rotational speed however a heavier platter creates more problems for the main bearing design. As the result of collaborating with a small, emerging, young British glass engineering company, the RP6 was the first Rega turntable to use a secondary precision engineered glass ring laminated peripherally to the primary glass base platter using modern CNC techniques to ensure concentricity. This keeps the inside of the platter as light as possible without sacrificing stiffness while placing much of the mass to the outside rim to create more flywheel effect. The Rega RP8 takes it one step further by laminating three rings together to produce the Rega RP8 super flywheel effect glass platter - an engineering triumph that does the job perfectly using simple cost effective materials. The RB808 tonearm uses the latest CAD designed Rega arm tube that increases stiffness and rigidity, redistributes mass, and further reduces stresses and resonances. The low mass high stability RB808 tonearm also uses a brand new low mass precision engineered vertical bearing assembly. But it is how the tonearm, particularly the bearing, is assembled that is absolutely key to the amount of detail retrieved from the record surface. The RB808 tonearm is meticulously hand built by a team of highly skilled technicians. Due to the fine tolerances involved each bearing is individually hand selected to find the perfect match for the chosen spindle. The bearing is then hand-adjusted for the right amount of freedom without any play. This simply can not be done by a machine. The tonearm is complimented by a bespoke Rega designed low capacitance phono cable and advanced phono plug assembly. The twist and clamp design locking the plug to the terminal increases connectivity and ensures the signal path is kept as clean as possible. The 24v low volt-age motor is controlled by a crystal locked, low distortion balanced sine wave TT-PSU electronic power supply via 4-pin plug. By hand tuning the positive and negative parts of the sine wave that drives the anti-vibration circuit built into the RP8 motor PCB, the motor vibration is virtually cancelled out. Thus the electronic speed control is not just a convenient way to switch turntable speeds but it significantly lowers the noise floor of the turntable to improve the signal to noise ratio from the cartridge. The Rega Apheta cartridge is the result of 4 years of research and is Rega's first moving coil cartridge. The design is a complete departure from conventional MC cartridges that have changed little over 50 years and generally contain foam rubber to damp the high resonance created by the suspension tie wire. Even if initially an optimally damped system is obtained as the foam rubber deteriorates the cartridge begins to ring and accentuate high frequencies with a loose bass. The Rega Apheta cartridge contains neither a tie wire nor a foam damper and takes MC cartridges in a new direction inspired by modern materials and the basic laws of magnetism. It surpasses the compromises of the older technology and simultaneously provides super clear high frequency and firm tight bass while delivering a healthy 500 microvolt output. When bundled with the RP8 and suitable phono stage (such as the new Aria), the price is very reasonable. Due to a vinyl renaissance there is no shortage of turntables on the market. A turntable is in many ways a straight forward device that is mechanical in nature and follows some basic laws of physics. Perhaps due to marketing however some of these tables make some rather extravagant claims based on some rather dubious "reasons to believe" technology. Myths abound such as the rather simplified "the heavier the better" concept that does not hold up to scientific scrutiny. 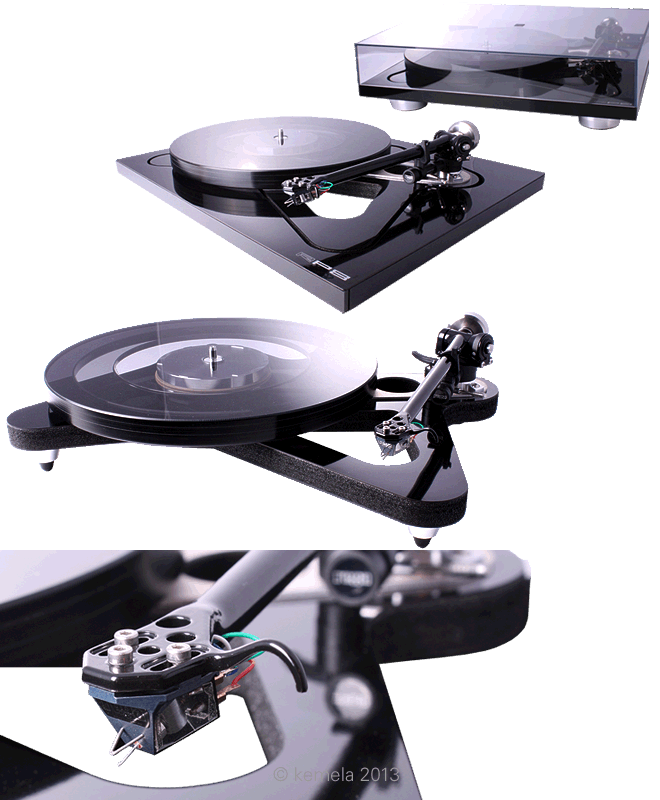 Rega turntables are designed with acoustic reproduction in mind rather than mechanical sculpture. They are effective mixtures of the best elements needed within an affordable budget that gets the job done reliably, practically and without too much ritual. It's about musical engagement and pleasure.